Greg Rucka’s seminal hero, Atticus Kodiak has been THE action hero in thrillers for over a decade. Kodiak took the mantle from such characters as Smiley and Bourne at the pen of one of fiction’s finest storytellers with stunning detachment. He moved the traditional intelligent thriller nonchalantly from the government clutches to the private sector while preserving all the traditional thriller hero’s internal conflict, natural abilities and stealthy resolve. 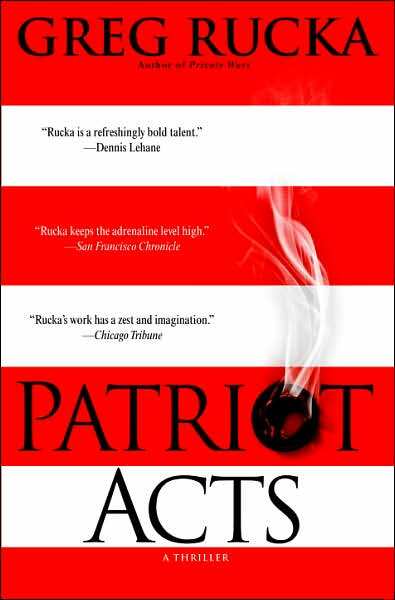 With PATRIOT ACTS Rucka returns to a world where the clandestine meets up in a web of private business and big government. The novel begins in Upstate New York, a deadly situation that soon goes terribly wrong for Kodiak and his team. An insider gives them up and Kodiak and the formidable “Drama” wait and train patiently to exact their revenge. The op, when begun, is “must read book”. Set throughout the world and in many different U.S. locations, PATRIOT ACTS is a Global thriller. Rucka is so grounded in presention of place, that you will travel with Kodiak from Washington state to Washington D.C. wishing you’d packed a suitcase. What Rucka continues to do with Kodiak is present top notch plots with a flawed character you cannot dislike. The very fact that Kodiak questions his own motivations and wonders where the line between right and wrong is drawn makes this character highly sympathetic. The fact that Rucka builds all of his characters without taking many breaks in the action of the story and even fewer in the dialog makes PATRIOT ACTS one of the year’s most visual books. Living in a world of paid assassins and financial privilege, being in love, and demanding vengeance for the doomed are classic thriller points that Rucka and Kodiak stoke with new flames. Intelligent, frightening and written in many shades of gray, PATRIOT GAMES will have you wondering where the moral line and public good meet. Rucka will leave you waiting for the next chapter in his epic and smart tale. Rarely does Crimespree post reviews of new books on our website before they make the magazine. The strength of this novel inspired me to do so. Rucka is a compelling writer whose work in prose benefits greatly from his work with the graphic novel and visa-versa. No one writing today has quite the same style or visual awareness of how words can paint the story and propel it forward with a breathtaking pace. Descriptive paragraphs can indeed be hidden in action. Characters can be refined with a simple task and defined within dialog. When Rucka writes he uses all of the tools a writer has at his disposal; that he does it with the equivalent of an illusionist’s slight of hand makes his books a form of magic. Sparse and lean and full of muscle mass, Rucka’s work is Novel on steroids. On Sale everywhere August 28th!